Mr Richard ’Scotty’ Gunn, was a well-known local character both as a fisherman and a prize fighter. He lived at 15 Kent’s Court, Upper Russell Street, and died in 1930 at the age of 65. 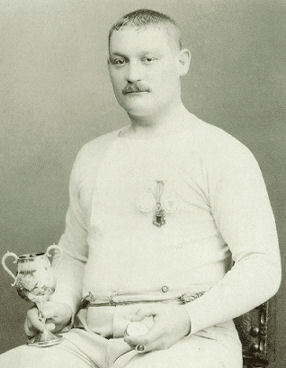 Born in Brighton in 1865 ‘Scotty’ soon began to win fame through his great strength. He earned his living as a fisherman, but as a young man he resolved that he would someday win the boxing championship of Sussex. The purses in those days were so small that he was unable to keep himself by boxing, and had to train as best he could while ashore from fishing. He was also a member of the Brighton lifeboat crew and as he took part in a number of rescues he was still further hampered in his ambition. His resolution was unshakeable, however, and he gradually disposed of all competitors who barred his way. His first public fight was in the eighties against Harry Golds. The fight was fought in a ring pitched in a room of a public-house at Preston, and ‘Scotty’ won by a knock out in the second round. ‘Scotty’ continued on his all conquering path, knocking out all corners. All his fights were fought with the “raw ‘uns” – the “mufflers” were only used for sparring – and the place of the battle always had to be kept secret from the police. In 1889 his great match took place with Albert Guy for the championship of Sussex and £10 aside.‘Scotty’ was then a tall powerful man of 14 stone, with a tremendous punch, and, he knocked Guy out after having matters all his own way. In recognition of his prowess he was presented with a silver watch, cup and medal, which his family still treasure. I believe that this particular Richard Gunn was a cousin of my Great Grandfather Thomas and that they had Grandfather in common. He was Richard Harman, and in 1881 they all lived in Bunker Hill, a slum area off West Street. The Harmans and Gunns have always had a close relationship and are real Brightonians. In the 1800s they were all fishermen and as the article indicated, life was very tough. I’m interested to know why he was called ‘Scotty’. Are you any relation to the Gunn that had a wet fish shop opposite Woolworths in St. James’ Street around the 1940s. My family used to shop there when we had an hotel at 6, Atlingworth Street, and I went to Montpelier College due to the fact, as I seem to recall, the son went, or had attended this school and so my father thought it sound a good school for me. ‘Scotty’ Gunn was my great-great-grandfather. It is wonderful to see his picture on here and to get to read more about him and his life. I can see the family resemblance in my brother Stephen Gunn – and I can also report that the formidable right-hook has continued through the generations! My g.grandfather Richard ‘Scotty’ Gunn (1862-1930) had three brothers, George (b1860); John (b1865); Thomas (b1869) and a sister Katherine (b1871). His parents were George Gun n(1838-1876) and Katherine (1839-1919) nee Harman. Her father was Richard Harman. The Gunn name has Norwegian/ Viking origins. Some settled in the Orkneys and then in the Strath of Kildonan, Caithness, known as the valley of the Gunns. Many Gunns were removed in the Scottish Highland Clearances in the early c19th to the coast to become fishermen. Many Gunns then migrated to the South. Hence the ‘Scotty’ nickname? Many Gunns, however,settled much earlier in Brighton. eg Henry Gunn is recorded as the High Constable of the ‘Hundred of Whalesbone in 1589 with several Richard Harman’s holding the position in the years to 1855. I would be pleased to compare Gunn family history records with other interested members. I would be very interested to find out if the Harmans you speak of had a daughter Elizabeth Willa Harman who married my grandfather Harry A Collings. I was always told we were related in some way to the Gunns and a Sarah Gunn does appear in our family tree.